Note: This article contains spoilers. Don’t read it if you haven’t seen “Iron Man 3,” especially since the film has more surprises than your average superhero movie. The first half-hour or so of “Iron Man 3” is fine. Certainly better than the sloppy “Iron Man 2,” but just fine. It’s familiar in its set-ups, giving us backstory, the introduction of a cut-and-dried villain in The Mandarin, the start of a dramatic arc for Tony Stark in his post-“Avengers” anxiety attacks. When Tony’s seaside home is destroyed, it’s the typical summer movie end-of-Act-I visual effects sequence that we expect to see in a modern blockbuster. 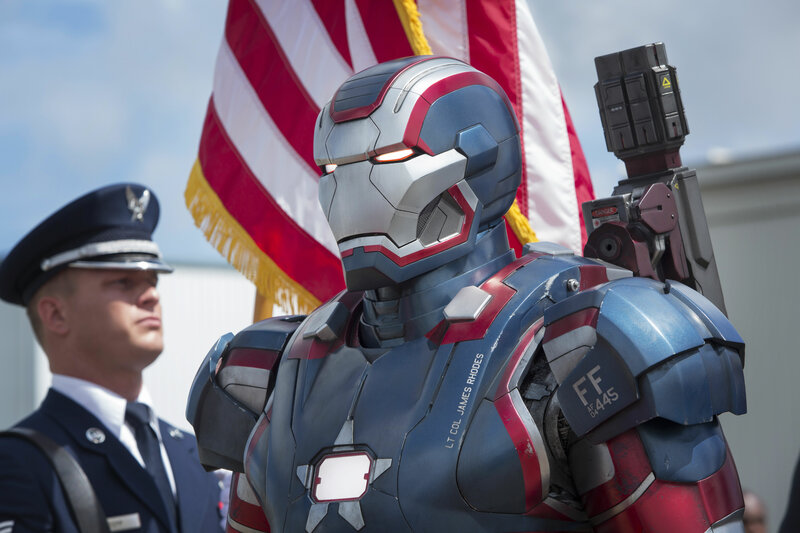 And then director and co-writer Shane Black throws the first big switchback of the film, and lets us know “Iron Man 3” is going to be a little different than what we expect from superhero movies. For example, big-budget action movies all take place in major cities, right? Batman cruises Gotham, and The Avengers fought the aliens in the heart of Manhattan because — it’s Manhattan. Welcome to Rose Hill, Tennessee. Following a lead, Tony Stark crash-lands in the small town, where he spends the next half-hour of the movie, his suit useless (that shot of him dragging it behind him in the show, like a kid with his sled, is classic), his defenses down. The only costume he has is a plaid vest and a camo cap. And it’s awesome. It’s exactly what this movie, and what most superhero movies need — some grounding. After the spectacle of the first act, it takes some confidence in a filmmaker to pull back like that when the conventional wisdom is to keep piling spectacle on top of spectacle. But he doesn’t. Instead, the Tennessee section focuses on humor — the scene with Adam Pally of “Happy Endings” as a superfan (“A Hispanic Scott Baio?” — a callback to “Kiss Kiss Bang Bang” maybe?) is a riot, and the back-and-forth with the kid who takes him in is great. That’s the other value of the Tennessee section, focusing on character. Without the distractions of his usual toys, we really get to see Stark up close, out of his usual franchise cocoon, interacting with strangers, whether it’s the kid or the grieving mom at the bar. How do you make a movie about a man in an invincible suit interesting? Take him out of the suit, and leave him out for as long as possible. (That’s what helps make that one action scene in Rose Hill so effective — out of the suit, Stark seems unusually vulnerable.) And Black knows to ease him slowly back into the suit — even when he goes to Miami, he’s got a bunch of jury-rigged gadgets, and has to fight a big battle with only an Iron Man glove and one boot. It’s smart filmmaking — rather than make the villains bigger and bigger, make the hero smaller. Which brings me to the third important part of the Tennessee section — it alerts the audience not to rely too comfortably on its expectations, paving the way for the surprisingly fun third-act reveals. (Ah, Trevor, we can’t help but love you!) As a result, the third act for me is a lot more fun than the first, with unexpectedly funny lines (“Seriously, I just work here. These people are so weird!”) and plot turns I never saw coming. Because plot turns aren’t supposed to be part of superhero movies. You set up the hero, you set up the villain, and you send them into epic battle. Black gets there, with that oil rig battle at the end (back to the familiar) but the path he takes is much more idiosyncratic and satisfying. Because it goes through a small town in Tennessee. “Iron Man 3,” “Man of Steel,” and “The Wolverine” didn’t match up to the superhero blockbusters of 2012. What did they miss that “The Amazing Spider-Man,” “The Avengers,” and “The Dark Knight Rises” got right? I like Iron Man 3 and we just created a Post-it art to recapture him in a different way of art.